This past weekend - Saturday, April 10th - was a beautiful day to have a discussion about the future of Indiana in the global Clean Energy Race. I spent this day at the Indiana Clean Energy Forum, created by four amazing high school students I focused on an earlier blog post! The Clean Energy Forum panelists included State Representative Matt Pierce, local businesspeople David Mann and Amie McCarty, Neil Hudelson from Repower America IN and Navy Veteran Dan Martin. Our panelists covered a lot but one statement that really struck a chord with me was when Mr. Martin spoke about his time serving in Iraq and how a fellow soldier told him, "each time you fill up your car with gas, you pay for bullets that could end my life." Now that veterans have added their voice to the clean energy debate, I couldn't help but think about friends who were serving and how this issue affects their safety (and ours). 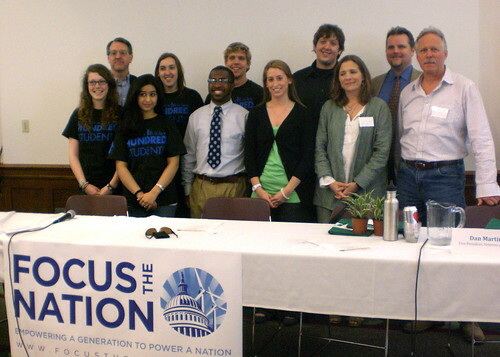 Just like the recent clean energy forum in Arkansas, the most inspiring part of this Forum was hearing from the four students themselves, about why they wanted to hold this discussion, why it’s important for their future, why it’s important for IN to hear their voices and listen to their ideas! Well, they inspired me; that’s for sure! I was so inspired, in fact, by their hard work and passion for getting their community activated in this conversation, that I had to get their thoughts on film! Watch the YouTube video of these students as they talk about how to get one started in your town. Hopefully this’ll spark you to do the same!